Fences are fine between neighboring properties, as far as they go. But often–especially in communities where lots are small–standard 6-foot-tall fences don’t block views of unsightly roof lines or a looming multistory building next door, or do enough to ensure your privacy. And building codes generally don’t allow for constructing anything taller than 6 feet. The temptation may be to plant a hedge, such as Pittosporum eugenioides, which will grow too fast and need too much pruning for most suburban gardens. Fortunately, there’s a better solution. The plants listed here (brush cherry, for example, which is back after nearly being wiped out by an insect pest) create screens that grow fast enough to block undesirable views within a few years but stay in bounds so you and your neighbor aren’t constantly hacking away at them to keep them under control. 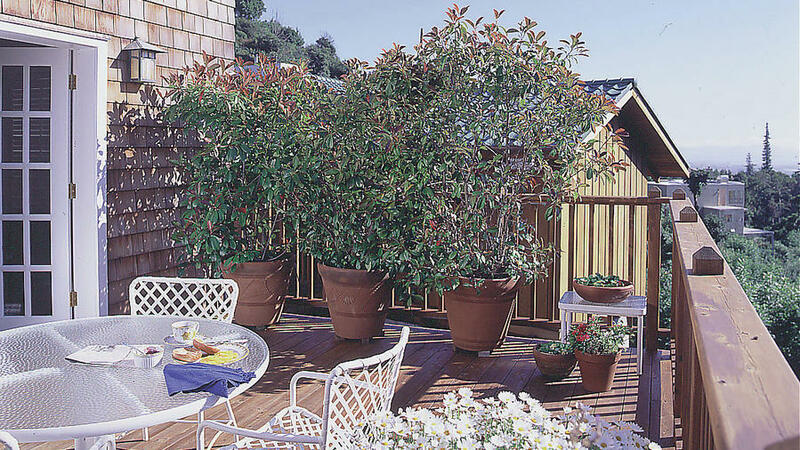 “Brush cherry is one of the best,” says landscape architect Lisa Moulton of Redwood City, California. “The lower leaves hang on even as the plant ages, and growth stays fairly narrow.” Dense, small-leafed evergreen plants are Moulton’s favorite types for screens. 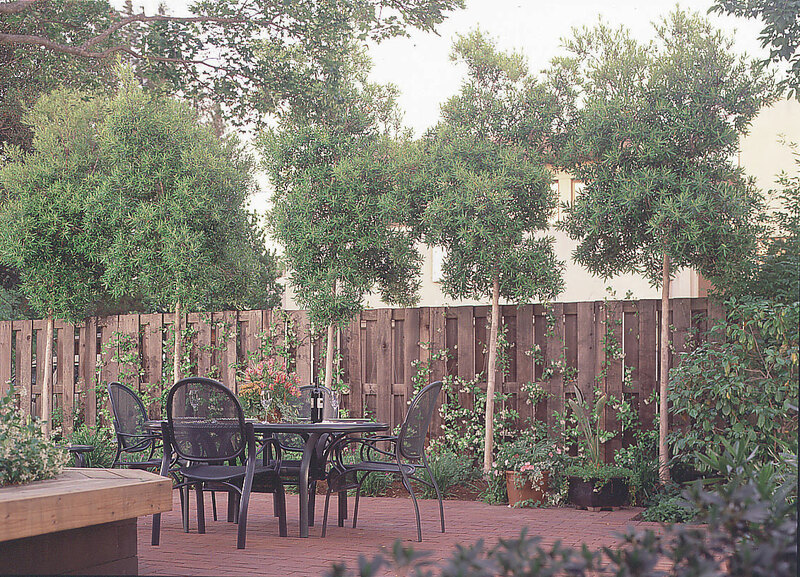 Landscape designer Abbey Kletz of Berkeley favors plants with a variety of textures, such as black bamboo and photinia. “I look for plants that have charm and that complement the garden,” she says. That means creating intimate and private spaces using plant screens with interesting foliage. To start your own screen, choose from the list a plant whose foliage colors, growth habit, and size suit your garden. Set smaller plants 4 feet apart, larger ones 5 to 6 feet apart. When planting next to a long fence, Moulton sometimes combines several types of plants to break up and disguise the fence’s linearity. For instance, she might group five brush cherries with five strawberry trees (Arbutus unedo) trained as standards. Water plants regularly the first year to get them established. After that, follow the watering requirements listed for each plant. If you want to slow growth, water less often. To speed growth, water and fertilize more frequently (but don’t keep the soil soggy). BLACK BAMBOO. New culms (stems) are green, turning black in the second year. Leaves are greenish yellow. To restrain its spread (black bamboo produces underground runners), sink an 18- to 24-inch-wide aluminum barrier around the planting area and limit water after the first year. Thin culms when they get crowded. Black bamboo can also grow in pots but needs regular watering. 10-15 feet tall. Full sun to part shade. Water during growth periods. Sunset climate zones 4-9, 14-24. BRUSH CHERRY (Syzygium paniculatum). Young foliage is reddish bronze; mature leaves are 1 1/2 to 3 inches long and glossy green. 30 feet or taller but can easily be trimmed to stay at 10 feet. Full sun to light shade. Water regularly. Zones 16-17, 19-24 (foliage or stems may freeze at 25° but usually resprout). FLOWERING MAPLE (Abutilon hybridum). Flowering maple isn’t a dense shrub and is even rangy if not pruned. Pinch back new growth to encourage branching and fullness. When the plant is full grown (about 10 feet tall), cut back by at least 3 feet every winter to keep lower foliage full. The pink-, red-, white-, and yellow-flowered varieties grow tallest (others may not screen). Full sun on the coast, partial shade inland. Water regularly. Zones 8-9, 12-24. LUMA APICULATA. Reminiscent of brush cherry, it has dense, dark green leaves 1/2 to 1 inch long and cinnamon-colored bark. 8-20 feet tall. Full sun. Little to regular watering. Zones 14-24. PHOTINIA FRASERI. In the ground it’s a tall, wide shrub, but in pots it stays more compact. New leaves are bronzy red, turning glossy green as they age. About 8 feet tall in pots, 10 to 15 feet tall in the ground. Plant standards to save space and to allow room for underplanting with flowers. Full sun. Water regularly. Zones 4-24. RHAPHIOLEPIS ‘MAJESTIC BEAUTY’. Glossy, leathery leaves to 4 inches long. Pink flowers in spring. Slow-growing to 15 feet tall. Plant standards for screening. Stake at planting time. Full sun or light shade. Little to regular watering. Zones 8-10, 12-24 (often survives in 4-7). STRAWBERRY TREE (Arbutus unedo). Oblong, dark green leaves are 2 to 3 inches long with red stems. Clusters of urn-shaped white flowers and yellow-and-red strawberry-like fruits appear at the same time in fall and winter. 8-35 feet tall. Plant standards to save space. Full sun to light shade. Little to regular watering. Zones 4-24. SWEET OLIVE (Osmanthus fragrans). Dense, compact plant 10 feet or taller with glossy green, oval leaves. Inconspicuous flowers that appear in spring and summer are very fragrant. Full sun to part shade. Little water once established (more in hot areas). Zones 8-9, 12-24. TRISTANIA LAURINA ‘ELEGANT’. Narrow, 4-inch-long, glossy leaves open red and turn green with age. Bark is mahogany-colored. Yellow flowers appear in late spring or early summer. 10 feet or taller. Plant standards. Full sun. Little watering. Zones 15-17, 19-24.